What a long, strange trip it’s been. In the last month I’ve traveled to Indiana, New Orleans, Berlin, Michigan and Ohio, and I’ve made good friends with the Detroit airport. Needless to say, I’m behind. But I promise to catch up fast, both with my travels and with some of the delicious spring lunches and dinners I’ve been enjoying. A few weeks ago I received the new Heidi Swanson cookbook, “Super Natural Everyday.” I’m such a geek, I actually pre-ordered this cookbook and was SO excited when it finally arrived. Pictured above is her recipe for Dilled Green Beenw with Seitan. 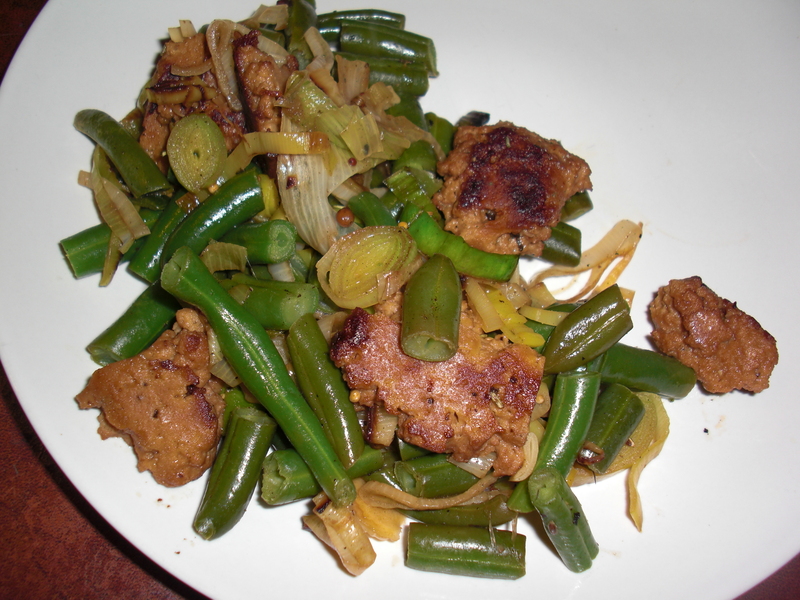 I used green beans that I froze last summer, leeks freshly harvested from my garden, and homemade seitan. It was quick, and it was delicious. I had my doubts about the dill (when its not eggs are potatoes I always wonder how the dill will compliment the dish), but like every Swanson recipe I’ve tried, this one was a winner! Because it’s fairly time consuming, I always make a huge batch of seitan, chop most of it up, and freeze it in just a little broth. A quick defrost and a delicious, small – effort evening meal later, I’m always glad that I did.